Keith’s newest novel is a survival horror zombie adventure. It’s about a single man living in a walled estate on a mountain, overlooking a city full of animated corpses. Augustus Berry knows that one day, he’ll be besieged by zombies, and so he prepares for that confrontation as best as he can. He survives by foraging supplies off the city below his mountain, coping with the fact that he’s one of the few survivors in this new world. Q: Where did you come with the idea? A: I’ve always enjoyed a good zombie story and planned to write one for a while. I have a few “classic” monster stories in my head––vampires, werewolves, goblins––and this was the first one to come out. I was a little concerned that the genre might be a little flooded with titles right now, but with the success of AMC’s “The Walking Dead” I thought I’d give it a shot. Like Vampires, zombies still hold interest for that one group of readers that are every bit as legion as the material. A: It’s about this one guy who survives the initial zombie apocalypse without any training whatsoever and gets lucky by finding a house perfectly situated on a mountainside. It was designed to be self-sufficient and not rely on any power grid, so you have wind towers and solar panels around the house. There’s also a wall that encompasses the property, which is the first line of defense against any zombie mob. I found that a lot of zombie stories start out with the virus—or whatever is causing the zombie outbreak­­­­––consuming the city, country and then proceed with survivors linking up, searching for a safe place, and later re-establishing society. I thought I would take a different approach, and just set the story two years after the fall of civilization. I was channelling a lot of Richard Matheson’s “I Am Legend” into this one. I first introduce the character of Gus in the short story “The Hospital” which happens something like six months before the events in “Mountain Man.” I had a lot of fun writing “The Hospital” (found in the novella of short horror fiction called “Cauldron Gristle”) and rather than making a new world for another zombie story, I decided to use Gus once more. Like I mentioned, it happens two years after the collapse of civilization, and while the book centers on Gus and his eventual companions and the things they do in this undead world, there is a hint of a mystery in there as well. And not about how the zombie outbreak began. Q: What research did you do for the story? A: House plans, solar panels, fire fighter equipment, firearms (and if you see any mistakes there, they’re all mine), food and the length of time canned food can still remain edible. I also watched a lot of documentaries. The series “Life Without People” is a must for anyone thinking about writing a zombie story because it addresses a lot of different things that I know I didn’t think of, like how long roads would remain intact if left unattended, or what would happen to house pets, that sort of thing. Very interesting for any post-apocalyptic world setting. Q: What do you like best about the story? A: There’re only a few characters in there and I try to make them interesting. Gus has a drinking problem, for example, as the booze is the only way he can cope with the horrors he encounters when travelling in the city. I like the “one man against an army of undead” concept with him already having a base of operations and some defenses in place. He’s just a regular joe who keeps defying the odds and survives just by being careful. There’s no scientist with a cure in here and no band of survivors on the run. It’s just one guy on a mountain, living as best as he can, waiting for the day when “they” find him. I also tried hard to control the gore in this one. My first horror book “The Missing Boatman” put off a few readers from the um, descriptions of gore. I know this is a zombie book and there are a few moments of blood and guts in there, but it isn’t as graphic as I could’ve gone. Instead, I tried working on getting a few frights in there, as well as working on the suspense. The idea of a “mass attack” that zombies present is a very worrying thing to say the least. They don’t ever stop and casualties mean nothing to them. And finally, I think it’s a fast read. Or, at least I hope people find it’s a fast intense page-turner. Q: Is it a complete story? It is and isn’t. I do have a sequel planned, and I’m working on it now. I wanted to tell the story all in one setting, but with Christmas coming up, I decided to cut the book at 75K word mark (or thereabouts) and get this one out in time for the holidays. I can’t say too much about the second book just yet, except that as bad as things are in the first book, they become very very bad in the second. I can promise though I’ll have the second book out very soon, and I swear I won’t pull a George RR Martin or a Stephen King. Q: Where can people buy the novel? A: Right now, only on Amazon http://www.amazon.com/dp/B006MV7I6U . I signed on for the KDP select program and gave them exclusive rights to the book for a three month period in exchange for promotion opportunities. It might be available on Smashwords a little later, but if a person really wants to read it, contact me and I’ll see what I can do. Q: Where can readers find out more about your work? A: Mostly on Amazon and a few titles on Smashwords. Come back here when you can, there’ll be some notifications on free stuff and guest blogs from some very interesting authors. If I’m up to something, you’ll be able to read about it there. Was recomended this book on the Other Ground forum. Really enjoyed it and literally couldn’t put it down. I will be on the lookout for part two. Hopefully sometime in May–MM2 is at the proofreading stage now. Happy to hear you liked the books! I just finished “mountain man” in one sitting…it’s a fun, thought-provoking read. As a fan of Indy zombie novels, I especially appreciated the flawless grammar, which is amazingly rare in this genre for some reason!! I can’t wait for the next one to come out…get busy, Keith! I just wanted to tell you how much I am enjoying the mountain man series, I’m on Hellifax at the moment. I’ve read quite a few zombie novels and this is my favourite series so far, part of me is going to be very sad when I have finished it and I have no more to read. 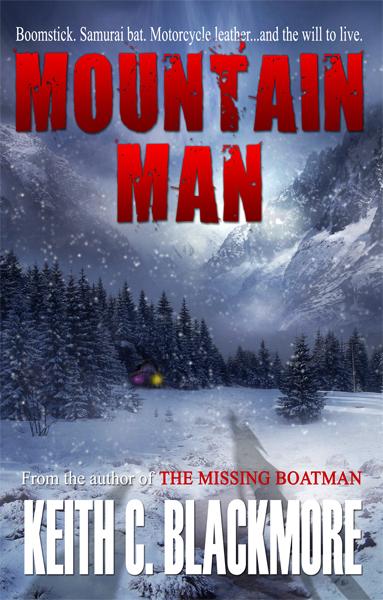 Found your Mountain Man series an exceptional read. Or rather listen. Didn’t do any harm, that RC Bray was the narrator obviously. Pace was just right. Nothing superfluous. Literally had me holding my breath again and again, until a scene resolved itself. Its impossible not to feel sympathetic towards Gus. I think we all overestimate how well we’d deal with the situations in which he found himself. I’m pretty certain we’d all create our own Captain Morgan and gawd knows where they’d lead us. I don’t have enough superlatives with which to describe how great your writing is. I don’t know if Hollywood could ever do the books justice, but if it could, I’d love to see Gus on the big screen. Woody Harrelson is one of the few actors with the range to do Gus justice IMO. Thanks for the great entertainment. Keith, I’m finishing up the series for the 3rd time (twice listened and once read). It’s my favorite playlist when i go for my long run ☺. Wish there was more, but I get why there isn’t. Going to start on Breeds soon. Thanks for the great writing and introducing me to a genre I never thought I’d enjoy.